Last weekend the Savoie wine region celebrated 40 years of being classified Vin de Savoie AOC with an array of local Michelin-star chefs serving impeccable food to over 300 invited guests. In the marquee erected for the occasion in perfect surroundings by the Lac Saint André circled by the vineyards of the largest crus, Apremont and Abymes, some of us wondered why we were not drinking the finest wines of Savoie during our evening. There continues to be a growing gap between the great and the just OK in Savoie wines. Whilst the region has begun to get its act together regarding promotional activities, it needs to learn to focus on its very best wines and to respect their producers who spread the word about the region’s wines around the world, benefiting the whole region. Perhaps I’m being too naive but surely it is these producers who should be encouraged to set an example for everyone else to lift their game. If one discounts the plethora of small wine regions in the south of France, in 1973 Savoie was the last important French wine region to be awarded AOC, having previously been categorized as the lesser VDQS. A mass of small wine producers had done a sterling job in rescuing the region from oblivion. In the 19th century the region had around 20,000 hectares of vines but this was down to below 1,000ha after the second World War. Today it has gone back up to double that and thankfully as everywhere else average quality has gone up too. The big growth in ski tourism in the 1970s helped Savoie’s wines to find a ready market – the French love to drink a local wine whilst on holiday and why not a light fresh white such as those produced in Apremont, Abymes or Chignin, made from the Jacquère grape? Or, indeed why not light reds, available in February, the peak ski time, and ready to drink from the previous vintage? 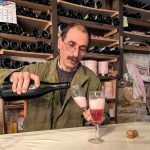 Most of the region’s producers thought these were the key wines they should turn out – in as large a quantity as possible at a price as low as possible, difficult considering their higher production costs on steep mountain vineyards. Tough vintages with lots of rain meant very high acid wines lacking in fruit especially if the yields were high, which in those days they were. Local oenologists soon taught the producers how to cover that acidity up with a little sugar, a taste that consumers were looking for increasingly, and especially it was deemed essential for the slightly fuller and exclusive Savoie white wines, Roussette de Savoie and Chignin Bergeron. The oenologists also taught Savoie to make Mondeuse like a Gamay, leaving it for as short a time on the skins as possible and even using semi-carbonic maceration. In this naturally low sugar grape that always needs chaptalization at high yields, the end result was something that tasted a little like a slightly harder Gamay with a different name on the label. Savoie wines back then were ordinary at best. By the time the Winter Olympic Games came to Savoie in 1992 the region’s producers were ready to provide copious quantities of easy-to-drink wines and seal their fame. 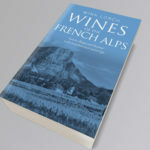 With the distinctive and elegant Savoie bottle now available, it certainly helped bring attention to the region’s wines though very few people looked to drink them except on holiday, for that’s what they all were – holiday tipples and nothing more. A few producers started to break the mould from small beginnings in the late 1980s: Michel Grisard of Domaine Prieuré St- Christophe and Louis Magnin, both in the Combe de Savoie with their old vine Mondeuse wines made as real, structured red wines of character built to age; Jean-Claude Masson with a range of Apremonts with minerality and flavour, also to age; Noël Dupasquier in Jongieux with his sublime Marestel Roussette de Savoie aged in old oak foudres. By the mid-1990s top local restaurants who had once shunned the wines started to take these wines and showcase a vertical of vintages, proving these wines could age. By the early 2000s the region looked to me like it was ready to lift its game, and to an extent it did. The yields started to come down and new regulations were drawn up to enshrine into law this and other quality measures. I found plenty of other producers beyond the four above that I could write about for Wine Report – Edmond Jacquin et Fils, Domaine de l’Idylle, Jean-Pierre et Philippe Grisard, various Quenard domaines (André et Michel; Pascal et Annick; Jean-Pierre et Jean-François), Jean Vullien and Domaine Belluard featured regularly as producing enjoyable noteworthy wines. Newcomers arrived onto the scene and caught my attention like D & D Berthollier, Domaine St-Germain, Domaine Genoux, Gilles Berlioz and Domaine Giachino. The négociants and cooperatives who like everywhere control a great deal of production would produce the occasional wine that I could recommend (from Domaine Perrier or Cave de Chautagne), but these producers lacked consistency, and others were much worse dragging the region downwards. There were also too many tiny estates producing rustically made, downright unpleasant wines, trading off the Apremont name to sell cheaply in the ski resorts. Meantime (still ten years ago), French neighbours (both second-home owners and local residents) at my home in Le Grand Bornand ski resort in the French Alps were astonished if I said I wrote about Savoie wines. Why, they would ask? They are all rubbish aren’t they? On the other hand foreign guests to my home would ask me in what local shops they could buy these great Savoie wines, such as those I might serve them for dinner, or were they all taken by the local restaurants? Can we get them in England, they asked. I stuttered hard. “You will find them chez Albert, but in no other restaurants here… and as for shops, well there are one or two good wines in the best local delicatessens, otherwise you have to go direct to the producers,” I would answer. Why weren’t the best wines being showcased in the region itself? Partly because the regional body and the best producers did not work together to promote them and make them valued. Partly because the wine region did not work with local tourism bodies or bother with English language promotional tastings, which seems crazy considering the number of foreigners visiting Savoie each year. On the other hand, the top local restaurants (rarely in the ski resorts, more in the cities and valleys), private individuals and some foreign importers began to beat a path to the door of the best producers. Since I stopped writing Wine Report five years ago, two inadvertently opposing movements have happened in my beloved Savoie wine region, this region that continues to play catch-up. One is that the Comité Interprofessionel des Vins de Savoie (the official promotional body of the region – the CIVS) has upped its game. And the other is that small groups of Savoie vignerons have increasingly taken matters into their own hands. After building a beautiful environmentally-friendly Maison du Vin at Apremont, the CIVS opened its oenotheque, a wine shop (though I’m not sure how many people know about it) and started encouraging groups to visit. It also launched a website somewhat late in the day, not a very easy or modern design, but not bad either and at least it is translated (by me!) into English. Among other activities, it has increased the number of press trips, especially linked to the region’s annual wine competition, it sponsors a music festival in Grenoble each year, and has promoted wine tourism more efficiently. 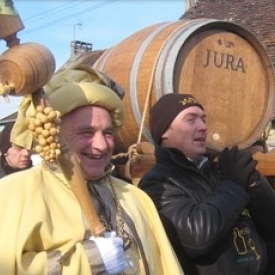 Yet it was local vigneron groups from the individual crus who were behind the origins of the hugely successful balade gourmande, a vineyard walk with food stops which takes place in a different Savoie district each year, now attracting over 2,000 participants. This year we attended it in Apremont/Abymes and Brett tells the story through some photos. The food was sublime prepared by Mickaël Arnoult of 2-star Les Morainières, and the atmosphere delightful, but honestly I’m not sure how much the event promotes the wines on a regional basis, as very few top wines were there and little obvious publicity. Completely on the other side of officialdom are several independent activities, at which if you are lucky you will see someone from the CIVS check in to take a look. Firstly, a group of wine producers calling themselves the Pétavins – all working organically – stage occasional professional wine tastings and other events to showcase their wines in Paris and beyond. Among the best producers of the region, the Pétavins include the domaines of Michel Grisard, Gilles Berlioz, St-Germain, Giachino, Jacques Maillet, Louis Magnin and Adrien Berlioz. At the start Dominique Belluard was also part of the group, but not being 100% organic (one steep slope is impossible for him to work organically) he now goes it alone and has such big demand from export markets that he has no wine available anyway. He remains a good friend of the Pétavins. Then there is the Centre Ampélographique des Cépages Alpine Pierre Galet founded by Michel Grisard among others that goes from strength to strength, at its heart honouring Savoie for the fact that the region is the cradle of so many amazing grape varieties. On the day after its annual get-together this year Michel organised an informal Mondeuse tasting with vignerons from Switzerland, but apart from some growers from the Pétavin group, hardly any other Savoie producers bothered to either submit their wines or attend the tasting. The invite was supposed to have gone out through the CIVS. The indefatigable supporter of Savoie wines on the social media circuit Franck Merloz helped to ensure a Vinocamp weekend (get-together of French speaking wine professionals and communicators working mainly on the internet) took place in Savoie last year. Somehow he managed to persuade the CIVS to host the day at the Maison de Savoie with on the following day a tasting hosted by the Pétavins. The two events formed a somewhat uncomfortable non-alliance with few from the Pétavins prepared to spend Saturday with the group and no-one from the CIVS there on the Sunday – for me this summed up the problems once again. I was honoured to be invited to attend the dinner put on by the CIVS to celebrate the 40 years of Vin de Savoie AOC. I was excited to see the lovely celebratory label created for the occasion on the Méthode Traditionelle sparkling wine served as an aperitif. No producer was mentioned on the label but I thought it was simply an example of the style for the future AOC Crémant de Savoie, not yet official but likely to be announced by the end of the year, with the wines on sale from 2016. The Crémant de Savoie designation is a good move for Savoie I believe (for the record Ayze and Seyssel will remain separate sparkling AOCs as well they should being entirely different in style), and I will write more when it is officially ratified. It was a good start to the long evening, but, apart from the very good food and service continuing early into the following morning, all went downhill from there right up to the extravagant firework display dragging us away from our dessert. The two biggest let-downs of the evening were a) the paucity of the vignerons in attendance – very few were given invitations, instead local politicians were given priority and b) the fact that we continued the evening with anonymous wines all of which were extremely young. Instead of celebrating with some of Savoie’s fabulous ageworthy wines, for ‘political’ reasons we were served wines with the same label as above with no producer mentioned, all from 2012 or 2011 vintages, much too young to show at their best. As to their producers most of them my neighbour at table, one of the rare vignerons with an invite, Denis Berthollier helped me guess. A few days later the press were sent the list so I know some of our guesses were correct – yes they were all medal winners, but all were ‘politically’ chosen, it was obvious. How fine it would have been to celebrate with a 10-year old Altesse and a 10-year old Mondeuse and to honour their producers in person, but again I’m probably being naive to expect this to happen at such an official dinner in a traditional European wine region. 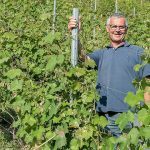 Potentially the Savoie wine region has everything in place to be a wonderful success in its next decade, as long as it can persuade and assist all the local producers to up their game in terms of quality and this must be a priority. Wines from vineyards with a backdrop of amazing scenery; a range of unusual grape varieties with both a story and a track record that consumers value increasingly; a natural lightness in alcohol levels, very much sought out today; idiosyncratic characters who make the wines; and climate change combined with better understanding of both viticulture and winemaking that have already come together to produce wines of greater quality and purity. Banish the average wines, work together and let’s raise all the vignerons and their wines high on a pedestal for their 50th anniversary.